The Grand Canyon Rim-to-Rim-to-Rim hike “R2R2R” is an amazing 48.3 mile trek (our consistent GPS readings), with an elevation change of 20,000 feet, and a potential temperature change of 70 +degrees. Warning – regular hiking tips don’t cut it in the GC. You need to do special training, understand the perils of canyoneering, and take exactly the right gear or you might die. R2R Day 1, South Kaibab to North Kaibab Trail: 56,735 steps, 27.16 miles, equivalent of 551 flights of stairs. R2R Day 2, North Kaibab to Bright Angel Trail: 60,276 steps, 28.84 miles, equivalent of 441 flights of stairs. Need a visual? How about this: 17 miles into the first day of the South Rim to North Rim hike you will climb up the Empire State Building 3.46 times at an average grade of 30% between the Supai Tunnel and the North Kaibab trailhead. At a high elevation of 8,325 feet. Most of us live and work out in much lower elevations and this is a critical fact. I have hiked R2R, R2R2R, and some Rim to River, every year since 2004 but I was stupidly unprepared for the early hikes. See my “Physical and Mental Training Tips for Grand Canyon” for extreme conditions and challenges. Take everything on my mandatory equipment list and read the trail tips (ex: dunk your long sleeve shirt in every water source to stay cool, beware of tight fitting high performance wicking clothes that can inhibit your natural sweat mechanism and actually accelerate heat stroke, take the Ribbon Falls cut detour to avoid the Fake Hill on North Kaibab). These are lessons are things I learned the hard way. You must prepare for each of these on any single day in the GC: high altitude + heat + low humidity in the desert + dehydration+ 10,000 feet elevation change + temperature swings + changing/unstable trail conditions + filtering and purifying creek water + prolonged/endurance activity + exhaustion + no quitting. Want running advice? Unstable rocks and trail conditions can roll/break your ankles and send you flying over the edge to your death. 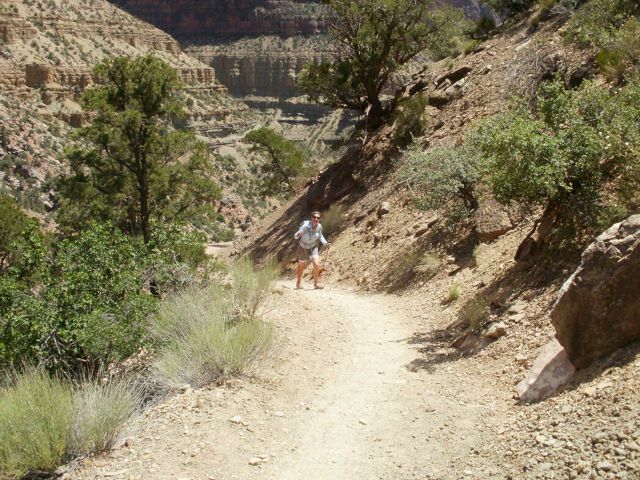 Runners also spend their day looking down at the trail instead of looking up and enjoying the magnificent Grand Canyon. Oh – and runners do not have the right of way on the trail – mules do, then hikers. Seriously, what is the point of being in the GC if you don’t even see it? Rest assured, fellow adrenaline junkies, the hike is much harder than a marathon. The R2R/R2R2R hike is dangerous and strongly discouraged because these hikers risk injury, illness, and death. We do our yearly R2R2R in late spring or early summer, so in general this site deals with issues and temperatures that are encountered during that time of year (although we have hiked in snow as late as June). If you are doing a fall or winter hike, please refer to the Winter Hiking tips page for off-season and cold temperature gear and tips – and be aware the North Rim is completely closed from approximately mid-October through mid-May. For spring and summer R2R’s we never begin later than 3 AM to minimize our exposure to deadly afternoon heat in the inner corridor. Your beautiful morning will turn into an intense personal journey at some point. Words can not express the natural beauty and raw emotions you experience when you hike Rim to Rim. It is gut wrenching when getting up to the Rim looks like you have to climb to the clouds, yet quitting is not an option. No one can get you out of the canyon but yourself, and this realization can be devastating. But step by step you get yourself out, and that is where you learn about your own strength and determination. You get a pure sense of accomplishment. You help other hikers along the way, and you are reminded of the rewards of kindness. You learn that a dream you never knew you had just came true. One thing is certain if you hike R2R2R. You will love or hate the Grand Canyon, and you will never be the same again. © 2013. Jean N. All Rights Reserved.